February is American Heart Month. It’s a great time to make strides in taking better care of your body and your health. But, while we all know we should take better care of ourselves, it’s actually easier said than done. Find ways to motivate and challenge ourselves and track our progress can be truly helpful. Now, this very motivation and accountability is available—literally–at your fingertips. With the increase in smart phones has come an increase in apps (applications) to meet every need you could imagine. Health and wellness is no exception. 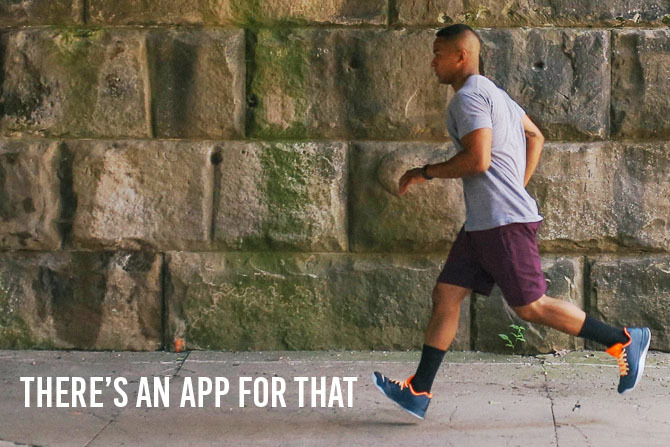 We’re here to share a list of our favorite apps to help you stay healthy. Most are free or cost less than $5 to download. Description: Of all the apps, this one does the best job of combining exercise and diet. Not only are you able to log your daily meals and snacks, you can also scan barcodes of food items to find full nutritional value. This app also creates sample workout plans for a variety of levels. Description: Track calories in and calories out with My Fitness Pal. You can track each item of your meals and snacks as well as the calories burned from your daily exercise. 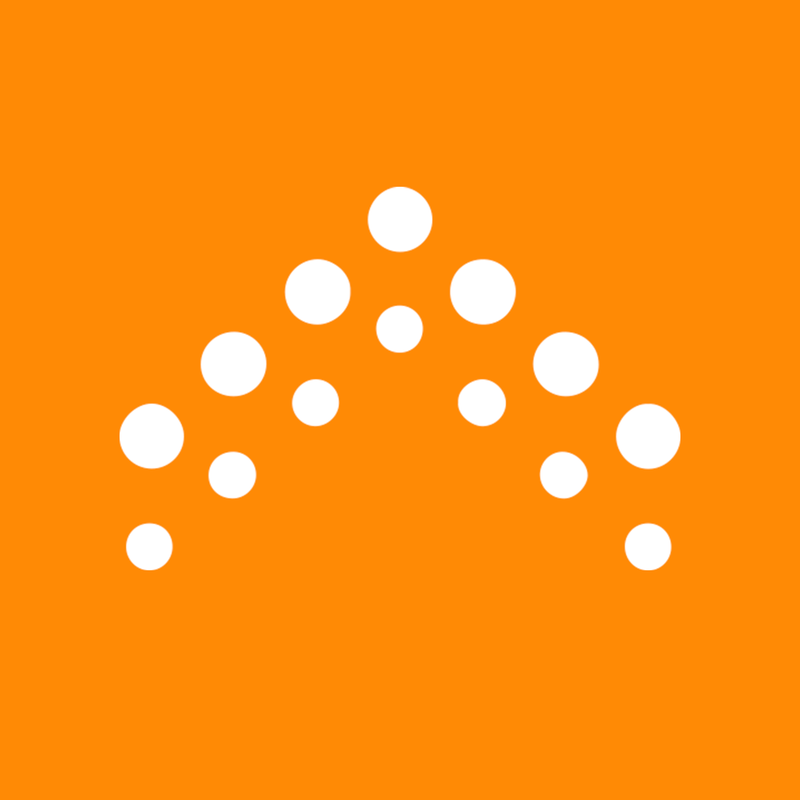 If what you’re looking for is accountability to help you stay on track, this is a great app for you! Description: FitJourney helps you track your weight loss by photographs. It keeps track of your weight, what you’ve eaten (with photographs as well), and can even give a decent estimate of your BMI. The visual component is powerful in helping you in your journey to lose weight, but the one big downside to this app is that it doesn’t offer much guidance, just accountability. For the self-motivated, visual person, it’s a great fit! 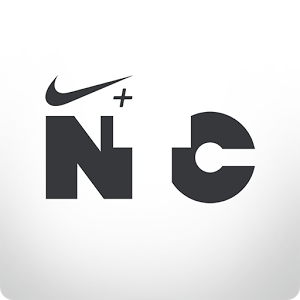 Description: The Nike Training Club app actually works like a personal trainer, containing a variety of workouts that include strength and cross training, cardio, and yoga. With videos to help you see what each move should look like, you’re never in the dark with any of your workouts. The one negative to this app is that if you are a beginner, it might be best to wait a few weeks after you’ve begun exercising to try it, or you may have to modify some of the workouts to fit your needs. Description: FitnessBuilder contains the largest library of exercise images & videos (over 7,000) produced with excellent form by our exercise physiologist, physical therapy and orthopedist team. 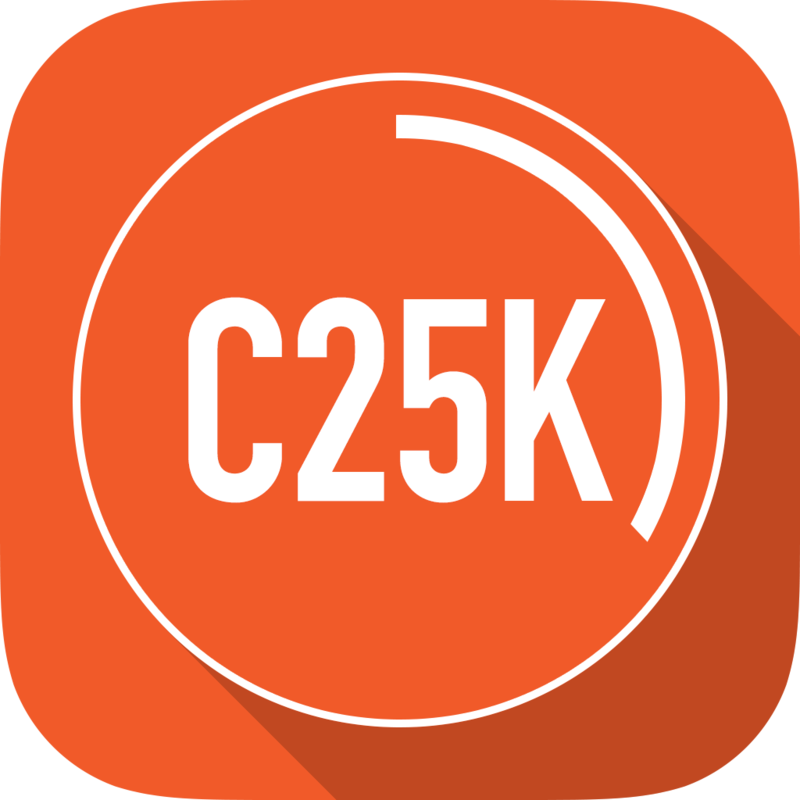 It features the most challenging workouts across all disciplines (over 900), access to a live personal trainer and the most complete set of workout building & performing tools, fitness calculators, tracking, scheduling and progress graphing features –on this app and syncing to the web. 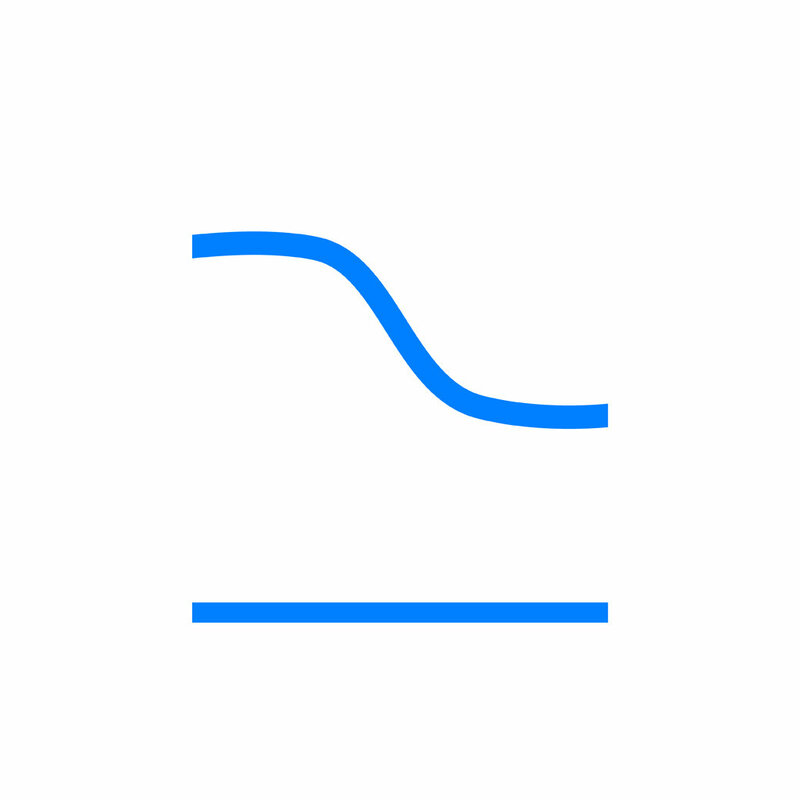 If you are a beginner, this might not be the app for you. However, if you have a solid working out experience, you will definitely benefit from this one! Cost: This app is free for one month. After that trial period, the Plus version costs $7. It’s the most expensive version, but definitely worth it. 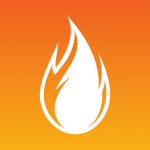 Description: This app is another great option to track your calories consumed and burned. Another great feature is that it allows you to set goals of what you would like to consume for proteins, fats, carbs, etc. 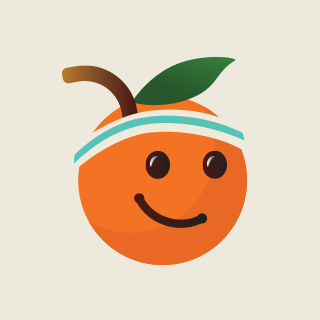 It also tracks your progress and allows you to connect with friends to receive accountability and encouragement. Description: Lose weight, track your progress, and eat REAL food. This is one of the only apps that looks beyond the calorie and helps you eat healthy and tasty. Scan a product barcode to see what’s really in your food. Fooducate will also show you healthier alternatives. The one thing some may not love about this app is that real food substitutes often require cooking from scratch. If you are pressed for time, it can can be difficult to cook from scratch. However, we think that cooking from scratch can be fun and gets faster with time! 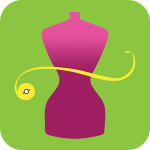 Description: (Note: this app is only available for women) My Diet Coach helps keep you motivated and committed to lose weight fast. It will motivate you, help keep you on track, resist food cravings, temptations, emotional eating, exercise laziness and other challenges by motivational arguments and guidelines, helpful and necessary reminders, notifications with your goal, and motivational photos and weight chart. 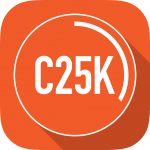 Description: If one of your goals is to run a 5K, this is the app for you. The popular Couch to 5K program is a great way to help you exercise more and meet a specific goal at the end of your time. 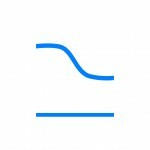 Description: This app is the most unique, and is also a fairly new app. The idea behind it is really great, but we don’t know a lot about how well it works. Each week you set your exercise and healthy eating goals each week and put a monetary value with each goal (working out a certain number of times each week, eating fruits or vegetables with every meal, etc). You snap photos of each meal and have them verified by other members, and check in to the gym, or track workouts via GPS and accelerometer. As you meet your goals, you will receive weekly notifications of your earnings. Missing a goal will cost, however! With such a wide range of apps available to meet every kind of fitness goal and plan, it’s easier than ever to live healthy. Which apps are your favorite? We would love for you to share them in the comments below! Note: as always, before you begin any exercise routine, it is important to consult with your doctor and get the best insight into what kind of exercise and what level is best for you. These apps are merely suggestions, and should be used until you have spoken with your doctor more. It’s normal to have questions and anxieties when facing any kind of health issue, whether it’s an illness, injury, surgery, recovery, etc. Every patient wants to receive the best care possible, but did you know that patients play a big role in the care that they receive? Inherent in any medical care is relationships — relationships between the patient and practitioners (physicians, therapists, nurses, etc.). When patients come prepared with the best knowledge of their symptoms, medical history, and current circumstances, the practitioners have a better understanding of their patients and can offer the best treatment plan. So what does it mean to “come prepared”? Time with practitioners is often limited, so by making a list of things you’d like to address you will make the most of that limited time. What symptom(s) is worrying you the most? Try to pinpoint when it started and anything that makes it better or worse. Avoid waiting until the practitioner is leaving the room to bring up another symptom or concern. Undivided attention is important in patient/practitioner communication. Patients will often hesitate to discuss financial or family concerns to practitioners. Health issues can be scary and it’s not easy to talk about them, even with your own doctors. Practitioners understand that medical problems and treatment are both financially and emotionally taxing. Don’t be afraid to communicate those concerns! 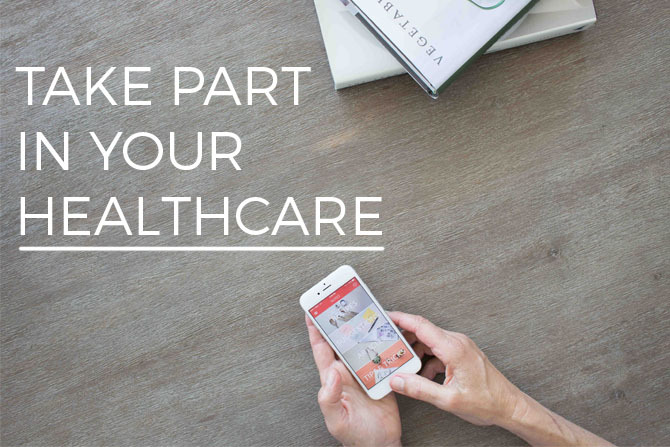 Are you worried about how you will pay for your healthcare and prescriptions? There may be programs to help you. If your practitioner doesn’t immediately know the answer he/she will direct you to a staff member who can help. Does your family need help coping with the stress of your illness or recovery? Support groups and/or counseling can do that. Let your practitioners know you need it! Don’t hesitate to ask, “What does that mean?” if a physician says something that goes over your head. If you don’t ask, the practitioner will assume you understand all that is being said. Ask about surgery risks, expected outcomes, prescribed medications and therapies. Tell your physician, therapist, nurse, etc. what you hear them saying. Make sure you’re all on the same page before anyone leaves the room. You might even think of questions in the middle of the grocery store or while watching TV — write them down and ask them at your next appointment. Remember, you are an active participant in your own healthcare. You are an expert on your body, your circumstances, your life. Your doctors are experts at what they do but they need your expertise on YOU in order to provide the best healthcare. The winter season presents specific risks and challenges that can be exaggerated for older adults. We value the safety of our patients while they are with us and certainly once they go home. Because of this we believe that it’s important to be prepared for the risks that winter weather can bring. Here are seven safety tips to help mitigate those risks. Keep warm. Older adults are at a greater risk of developing hypothermia — a dangerous drop in body temperature — during cold weather. Aging lowers one’s ability to withstand longer periods of cold, even from just sitting in a colder than normal room. Certain conditions and medications can also affect a person’s ability to sense cold, making them especially vulnerable. Because of this, older people should keep indoor temps above 65 degrees and look for the warning signs of hypothermia – shivering, cold and pale or ashy skin, abnormal fatigue, sudden confusion, and/or slowed breathing and heart rate. If you notice these symptoms call 911 immediately. Avoid falls. While falls are a constant concern regardless of weather, seniors need to be especially vigilant in avoiding falls during the winter. Ice, snow, and mobility impeded by cold temperatures can wreak havoc on a normally safe environment. Given the particularly dangerous nature of falls in older adults, it is crucial for individuals and their loved ones to keep steps and walks clear of snow, ice, and other potential fall hazards. Be especially cautious when using canes, walkers, crutches, etc. on snow and ice. Watch for wintertime depression. 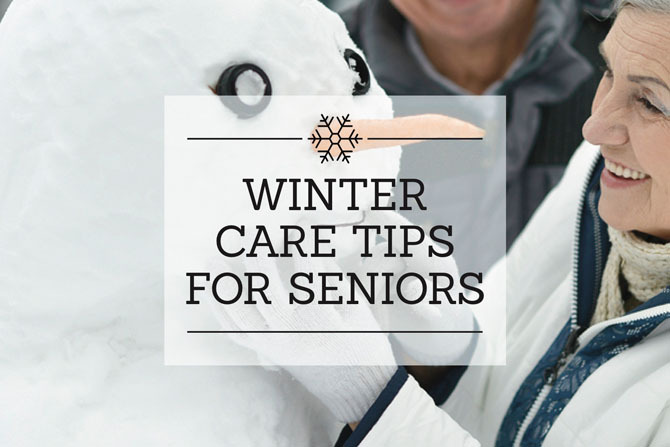 It’s not uncommon for older adults to alter their social engagements during the winter months because of the cold and inclement weather. While this seems like a good idea in terms of limiting exposure to winter illnesses and avoiding fall risks, it can actually have a negative impact on one’s mental and emotional well-being. Staying active and finding alternative social outlets is a big factor in avoiding wintertime depression. If you have older family members who are at risk of becoming isolated, make an effort to visit, call, or arrange activities to keep their spirits high. Eat a varied diet. When it’s cold outside we’re less likely to get the sun exposure that we need for our bodies to produce Vitamin D, and we tend to eat a less varied diet. Eating foods with Vitamin D, like milk, grains, and certain seafood can help with this deficit. You might even talk with your doctor about taking a vitamin D supplement. Drive safely. While safe driving practices are always paramount, hazards can be exaggerated during inclement weather. It is important to know one’s limits when it comes to operating a vehicle. If you don’t feel comfortable driving in ice and snow, ask a friend or family member for a ride. Another concern on the road is emergency preparedness. Make sure you have supplies in your car to keep you safe in case of a stranding or accident. Warm blankets and clothes, food, a flashlight, and an ice scraper should be standard equipment in the car. Always travel with a cell phone and charger in case you have an emergency. Another way to avoid problems is to have your car winterized by a trusted professional. By following these basic safety tips you and your loved ones can reduce the risk of serious problems this winter. Stay warm and be safe! Jan 13 Comments Off on Congratulations to our “Of-The-Year” recipients! Congratulations to our “Of-The-Year” recipients! 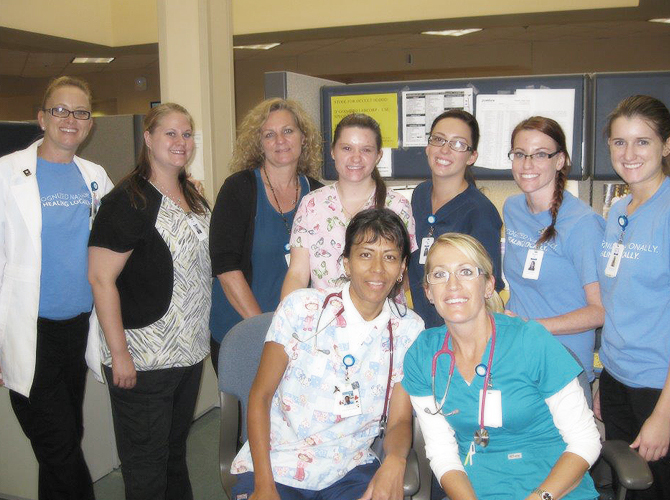 At Mountain Valley Regional Rehabilitation Hospital, we have an amazing group of passionate, patient caregivers. Monica Durocher, a nurse at Mountain Valley Regional Rehabilitation Hospital, recalls many long nights studying as a nursing student at Northland Pioneer College in Show Low, AZ. After 9 years in the profession, Durocher still feels the same way. Like many of her colleagues, Durocher values the importance of staying abreast of the latest medical developments, techniques, and treatments in her field through professional continuing education. In addition to the continuing education Durocher participates in to maintain her state nursing license, she also has voluntarily earned – and maintains — the national Certified Rehabilitation Registered Nurse (CRRN) credential. Nurses who achieve this credential demonstrate knowledge, experience, and commitment to excellence in providing comprehensive care to people with physical disabilities or chronic illnesses. To earn the CRRN designation, Durocher met clinical practice requirements in rehabilitation nursing and passed an exam that confirmed her extensive knowledge in the field. The exam covered the scope of rehabilitation nursing practice including models and theories; functional health patterns such as theories, physiology, assessment, standards of care, and interventions in individuals with injury, chronic illness, and disability across the lifespan; function of the rehabilitation team; community re-entry; and legislative, economic, ethical and legal issues. Along with CRRNs, some of the staff at MVRRH also is Neuro-IFRAH certified. This means that they have specialized knowledge to treat and manage adults who have suffered brain injuries or strokes. Others are certified hand therapists who focus on the rehabilitation treatment of the hand and upper limbs, which can include tendon, peripheral nerve, crush or repetitive motion injuries. 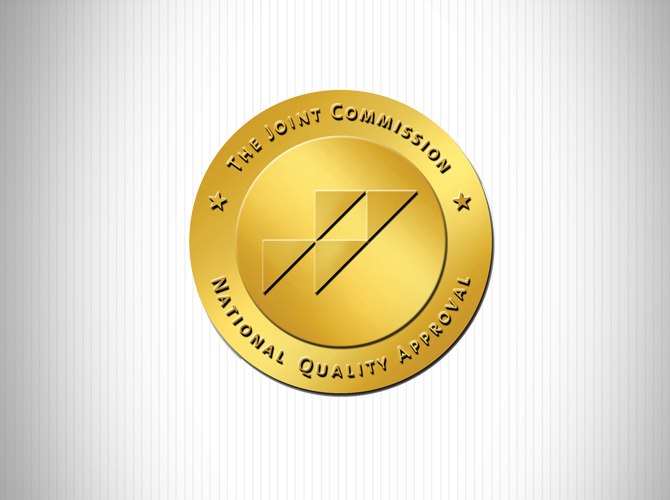 Mountain Valley Regional Rehabilitation Hospital recently received The Joint Commission’s disease-specific certification for Brain Injury rehabilitation, which signifies the hospital’s dedication to developing better results for brain injured patients. The award was given after a rigorous on-site review by an expert evaluator. Effective use of evidence-based clinical practice guidelines to optimize care. 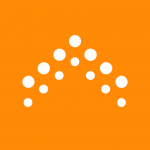 Organized approach to measuring performance in patient safety, patient satisfaction and patient outcomes; and then consistently improving that performance. 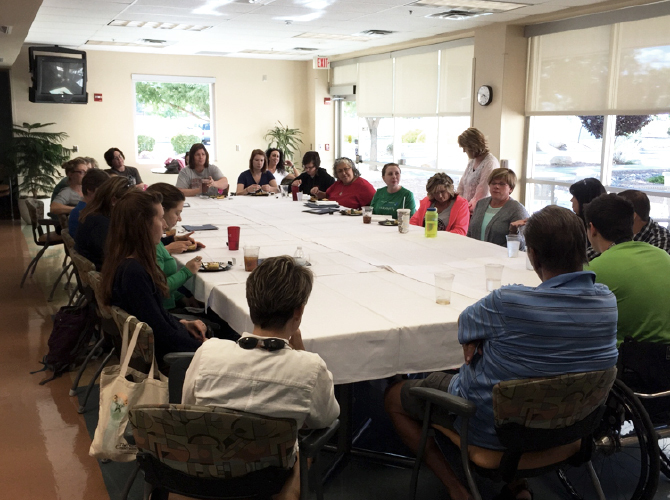 Mountain Valley Regional Rehabilitation Hospital recently hosted a training course for our therapists in Post-Acute Care Management and Rehabilitation of Persons with Spinal Cord Injury. Our team spent an intense weekend improving their knowledge and skills in helping our patients recover from spinal cord injuries. Sunday at the end of the formal program, we all sat down with two former patients with spinal cord injuries for a round table discussion of their experience and how it can be applied to future patients. 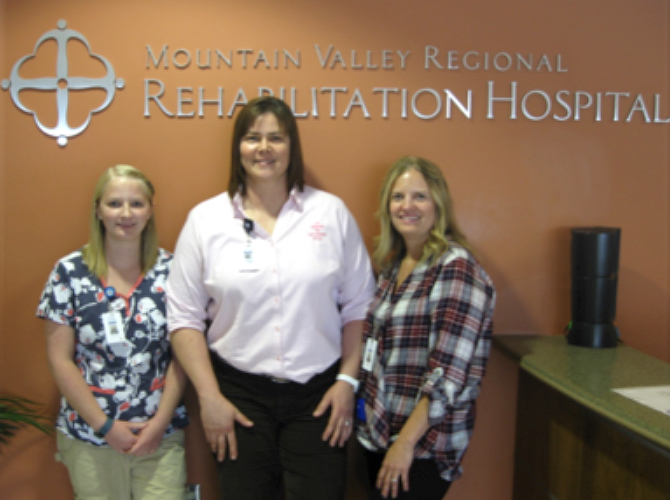 Mountain Valley Regional Rehabilitation Hospital is part of Ernest Health. Ernest Health provides specialized medical and rehabilitative services to our patients through our rehabilitation and long-term acute care hospitals. We treat patients who often are recovering from disabilities caused by injuries or illnesses, or from chronic or complex medical conditions. Our leadership team brings extensive healthcare experience to Mountain Valley Regional Rehabilitation Hospital. We invite you to meet them and learn more about why they are passionate about healthcare. At Mountain Valley Regional Rehabilitation Hospital, we are committed to being good neighbors and responsible corporate citizens in the Prescott Valley community.